New Amiblu Brochure: Jacking Pipe Systems! 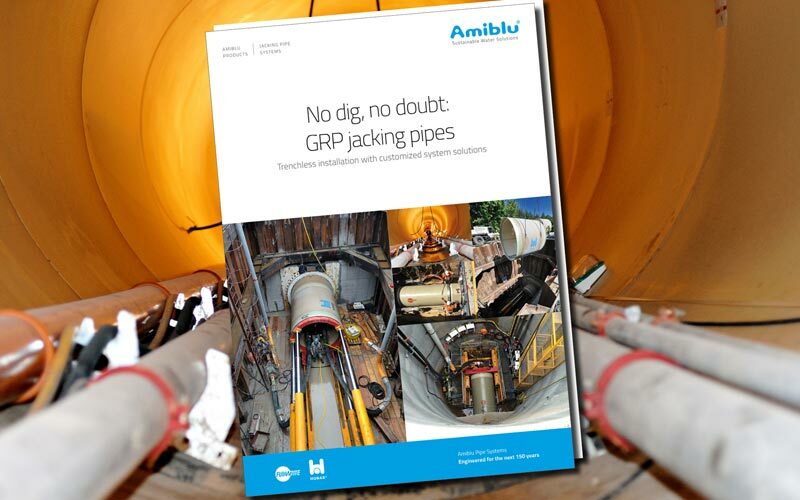 14 Jan New Amiblu Brochure: Jacking Pipe Systems! What’s a better way to start a brand-new year than with a brand-new brochure?! We proudly present to you our Amiblu Jacking Pipes brochure. With their smooth, almost non-absorbing exterior surface, tight outer-diameter tolerances and light wall structure, Amiblu GRP jacking pipe systems require the lowest necessary jacking loads in the industry and are suitable for very long and also curved drives. The comparably small outside diameter makes it possible to use smaller jacking machines, resulting in less excavated material (> 25 % less than with concrete pipes) and reduced overall equipment and construction costs. A weather-independent installation further reduces the installation time and expenses. Thanks to the pipes’ corrosion and abrasion resistance, high structural stability, and leak-tightness, they feature an extraordinary operational service life of over 150 years. Find these and many other benefits of Amiblu jacking pipes in our new brochure! Click the button below to download your copy.